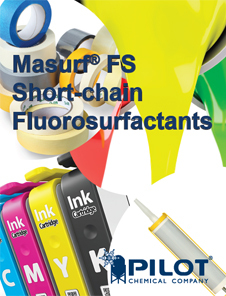 Masurf® FS-3300 by Pilot Chemical is a 100% active C6-based ammonium fluoroaliphatic phosphate ester for use in paints & coatings. It is a leveling agent, defoamer, flow and rheology modifier and adds soil resistance. It is used in water-based latex paints to extend open-time (wet-edge time). It contributes exceptional rheology and surface modification, spreading and leveling properties. 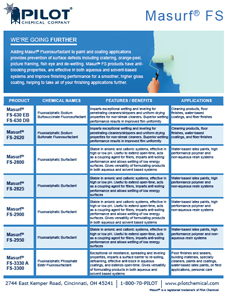 Masurf® FS-3300 is also used in solvent-based coatings and alkyds to impart oil and water repellency, stain resistance and antiblock performance. It is an effective anti-block in aqueous coatings such as gloss and semi-gloss paints. It is listed on ENCS, IECSC and TSCA inventory.